On the final day of the Championships, the first medals to be won were for the dressage Freestyle class. This is a freestyle to music competition where the riders have to include a list of compulsory movements but they can be performed in any order so riders can choose their own floor pattern as well as music to enhance their pony's performance. There were two British riders through to this class and Erin Williams & Dynasty (Deinhard B x Arts-Dancer-Boy) were drawn to go in first. Erin had chosen her own music and developed her own floor plan to best suit her lovely palomino mare. Erin's music was all from the film Dirty Dancing and she finished her test to the track "Time of my Life" which was both appropriate and slightly poignant as it was Erin's last international pony class. Erin looked pleased with her test and the judges average score of 74.750 put her into the lead at this point (and they ended up in 6th place). This is Erin's last year in ponies, but she also has a lovely horse and has already been getting very high scores in Junior classes (including winning at the Addington CDI in April) so she will be aiming to compete at the Junior European Championships next year. Immediately after Erin it was the other GB combination through to this stage, the individual Gold medal winners, Phoebe Peters & SL Lucci (Lukas x Bazar). Although Lucci looked a little tired on another very hot day, Phoebe rode a lovely test that fitted well with her music and showed off Lucci's high quality work beautifully. There is never any live scoring during a Freestyle test, so the British supporters had to wait until after the next rider for Phoebe's score. As the score was announced judge by judge by the commentator, he was drowned out by the cheers as 84.000% appeared on the scoreboard. Believed to be a Championships record, Phoebe's score looked unbeatable, but there were still 4 more riders to go - including those who won Silver & Bronze in the Individual Championships. One by one, however, they failed to take the lead until there was just the 2012 Champion and 2013 Individual Silver medallist, Semmieke Rothenberger (GER), to ride. Tension built as all waited for Semmieke's score but when it was finally announced, she was over 3% behind Phoebe and this was only good enough for Bronze. Semmieke said afterwards that it had been a wonderful Championships and although her team test with Deinhard B had not gone how they'd expected (he'd been very unsettled at the start), she felt that they'd done their best in the individual and then the Freestyle had been very close. Asked afterwards about her plans for next year, Semmieke said that she has another pony that is her hope for next year but that she'll be keeping all her ponies fit so she has options. 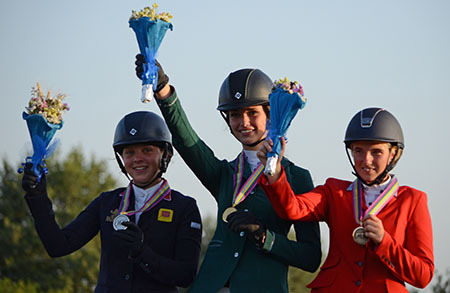 Silver went to Lisanne Zoutendijk (NED) and Champ of Class, the Bronze medallists in the Individual Championships. Lisanne said afterwards that she'd come to the event hoping to finish in the top ten, so was "very very happy" to take home Silver & Bronze medals. Lisanne has another year in ponies and hopes to be back with Champ next year. At the press conference, all the riders, Chef d'Equipes and judges that spoke praised the organisation and facilities at the event. The judge at M, Susanne Baarup (DEN) commented on the high standard at a "fantastic championships". She also said that SL Lucci was "in another league" and was proud that he was born in Denmark. As for the new European Dressage Champion, Phoebe Peters, she too thanked the organisers and said it had been "amazing" and that she was "very proud of Lucci" and how he'd risen to the occasion. Saying that it all felt surreal, she made a point of thanking her family, trainer, supporters and sponsors. For comparison, last year Phoebe & Lucci scored 70.525% and finished 14th. As Phoebe is only 14, she is still eligible for the Pony Euros next year and she's planning to continue to improve with Lucci and "see what happens". The first challenge for the Eventing competitors on the final day was the trot up. In 2012, Charlotte Bacon withdrew Three Wells Breeze at the trot up and with GB in Bronze medal position and Ireland just 0.7 behind, it was essential that the ponies passed. Fortunately, this year all 6 of the Charles Owen sponsored squad passed, as did all the other nations' ponies. So the pressure was on all the team members to produce clear rounds and maintain the Bronze medal position. Just an hour after the trot up finished, the Jumping phase started and the riders jumped in reverse order of merit. With the first rider on the course having 2 fences down then being eliminated for two refusals and then the second rider having a clear round, it was difficult to guess how the rest would do. However, when all bar 2 of the next 15 ponies had jumping and/or time faults, it became obvious that the jumping phase was going to be influential. GB's first representatives were team members Charlotte Bacon & Three Wells Breeze (breeding unknown) who had an overnight score of 50.8 having gone clear within the time across country the previous day. To British supporters delight, they achieved an elusive clear round and so finished the competition in 11th place on their dressage score (having been in 18th place after the dressage). Four ponies later, it was individuals Chelsea Pearce & the British bred SPSS Elite Graded mare, Catherston Nutsafe (Catherston Nightsafe x Dutch Courage). All looked good until they had 4 faults at fence 6, an upright with a blue water tray. However, Chelsea didn't let this affect her and completed the round without further faults. 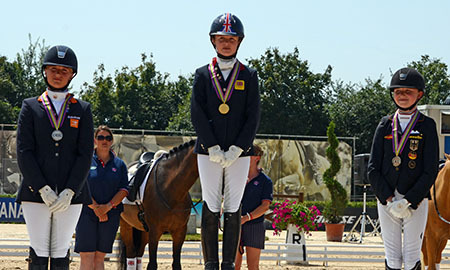 Chelsea is the only one of the British riders to be young enough to compete again next year as the rest move on the Junior level. Next in were team members Libby Seed & Mr Vick (breeding unknown). Libby & My Vick had been selected to go first for the team in the dressage and XC phases as Mr Vick is a very genuine pony who would go clear across country and take the pressure off the others. Libby & Mr Vick also delivered on this expectation in final phase with a lovely clear round that meant they finished in 7th place. Rose Nesbitt & Carrowmore Gemstone were immediately after Libby. As the penultimate British team member to jump, another clear was required to keep the pressure on France & Italy who were still in Gold & Silver medal positions, although 4 faults from the 2nd Italian rider to jump had narrowed their lead of GB to just 0.5 of a fault. Rose & Gemstone delivered a careful clear round to delight supporters and then there were just 9 more competitors to jump, including 2 for both France & Italy and 3 for Ireland. As it happened the 3 Irish riders were next to jump with Donnacha O'Brien and the legendary Ice Cool Bailey going first. Having flown round the XC in the fastest time of the day (34 seconds under the optimum time), Donnacha & Bailey sadly had the 2nd and 3rd fences down. This meant that the gap between GB and Ireland increased to 8.7 faults, a more comfortable margin! Clear rounds then followed for the remaining Irish riders, Lucy Latta & Nono and Shannon Nelson & Millridge Buachaill Bui. This must have been a relief for Lucy as in 2012 she dropped from 5th to 10th place due to having 2 fences down. At the press conference, Shannon praised her 8 year old pony who she said was generally good but could also be spooky. At this point, Ireland where the only one of the top 4 teams to have a final score (of 142.9) and this ensured they could finish no lower than the 4th place they'd held going into the Jumping phase. The next rider in was Maria Sole Girardi for the home team, riding the Connemara, Loughtown Lass. Having had 4 faults at fence 2, Maria rode carefully around the rest of the course and as a result also had 4 time faults. This meant that GB moved above Italy into potential Silver medal slot - but only if Yasmin Ingham & Craig Mor Tom went clear. Before Yasmin however, Marine Bolleret & Perle du Boisdelanoue jumped for France. A clear round put pressure on Yasmin, who was in 3rd (ie individual Bronze) place after the XC and only 1.2 penalties ahead of Marine. Yasmin kept her nerve and ensured that she'd finish without time faults by riding the 4th fastest round of the day but more importantly, it was a clear round. This ensure that GB finished on 142.2 penalties and would be no lower than Team Silver and Yasmin would get the Individual Bronze medal. At this point, with the last Italian & French riders still to jump, France had a fence in hand over GB and Italy had a fence in hand over Ireland. Matteo Guiducci (ITA) & Mon Nantano de Florys had to go clear to stay ahead of Yasmin and when they had the influential fence 2 down, Yasmin moved up to individual Silver. A further fence (9a) down knocked the Italian team down to 4th place and Ireland moved up to Team Bronze. Last to jump was Victor Levecque (FRA) & Qualitat des Bourdons. Leaders since the dressage and having impressed with his riding in the dressage and XC phases, Victor could have one fence down and still win Team & Individual Gold. So when fence 4 fell, nothing changed, but then he rather dramatically had a refusal at fence 8 and all of a sudden it was obvious that Yasmin had the individual Gold and the GB supporters were frantically trying to work out if it was Team Gold too or if the French had clung onto it. 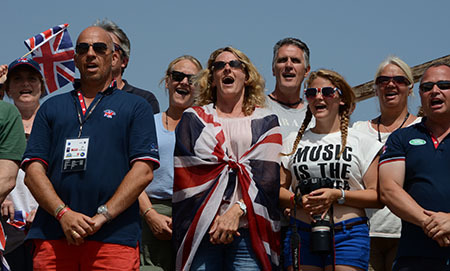 After a tense period of expectation, the official results were announced and to the British supporters delight, it was GB Team and Individual Gold. At the press conference after the medal ceremony, the British Chef d'Equipe, Sarah Hancox, praised her team and individual riders saying what a "talented bunch they were and how they'd bonded into a great team and that she was "extremely proud" of all of them. Sarah also pointed out that all 4 team members had finished on their dressage scores, a significant achievement. Sarah said that although the XC hadn't proved influential in the end, they always respect every XC course and had prepared thoroughly for it so all of the British riders & ponies went round it comfortably. The back up team and parents were also praised as "amazing in the preparation beforehand and afterwards". The French Chef d'Equipe, Emmanuel Quittet, said that the event had been great and possibly even better than when it had been in their own country (in Fontainebleau) in 2012. They were also pleased to have improved from their 5th position at that event to the Silver medal. With 3 of his team still eligible for ponies in 2013, he was looking forward to next year already. Sue Short (the Irish Chef d'Equipe) said it was always a good day when they finished on the podium and that she'd woken up that morning desperately hoping that they'd not finish 4th by the 0.7 penalties that they'd been behind by since the dressage! Sue praised her team and said what good horse people they were and that they'd really earned their medals. Then talking to the individual medallists, the Press Officer said how much she'd been impressed by Bronze medallist Victor Levecque's riding over the first two phrases. Victor spoke little English but seemed positive about the experience. Marie Bolleret said that she was very happy to win the individual Silver but was also disappointed for Victor and their objective always is Gold and the implication was that other countries will need to watch out next year! British Gold medallist, Yasmin Ingham, said that it felt "amazing" and she hadn't expected double Gold. She praised her support team of Sarah Hancox, the team physio and vet, team trainer Jonquil Hemming and thanked her "amazing" parents, British Eventing, UK Sport, pony team sponsor Charles Owen and lottery funding. When asked about Tom, all Yasmin managed to say was that he was a "special pony" and she'd had him 3 years before being overcome with emotion. Sarah Hancox said that Yasmin had worked so hard to improve Tom's dressage with the help of her trainers at home, Sylvia Shaun and Mark Smith, as well as with the team trainer, Jonquil, and her mother Lesley who had evented in the past. Yasmin later said that Tom was "on a mission cross country" and he was a genuine pony who had been very good all year. Yasmin and her family live on the Isle of Man so for all the team trials they had to travel over on the ferry, returning in between as Yasmin is at school on the island. Tom is Yasmin's only pony and they are now looking for a horse for her as she is 16 this year so has to move out of pony classes. Yasmin's younger brother isn't interested in riding Tom as he prefers riding motorbikes! The moment when Qualitat des Bourdons and Victor Levecque lost team and individual Gold medals. All of the British Jumping riders went through to the two round Jumping Individual Final. Scores are carried forward from previous rounds and only one rider, Jessica Toelstang (DEN) & Nikolina had a zero score. Ninon Castex (FRA) & Quabar des Monceaux had one time fault from the first individual round and then there were 8 riders with 4 faults, including GB's Faye Adams & Some Like It Hot, Millie Allen & Song Girl and Emily Ward & King Mac. Amy Inglis & Lea du Genier carried through 12 faults and Alex Gill & Ammanvalley Santino had 16. There were 30 competitors in the Individual Final and first round was clearly a challenging course with half the riders having 8 faults or more. Sadly this included GB individuals, Alex Gill and the British-bred gelding Ammanvalley Santino who were first to go and had 2 fences down to add to the 16 faults they'd carried forward from the first individual and two team rounds, Bred by Chris Richardson at Ammanvalley Stud in South Wales, Santino is by the black Welsh Section D stallion Cruglwyd Sant who used to stand locally and out of an unregistered leopard spotted mare called Chino who is thought to be by the Appaloosa stallion Ready Money. Alex, along with Faye and Emily, will still be eligible for ponies next year and they will all have gained valuable experience. The British supporters then had to wait 14 riders before the first of the British girls, Amy Inglis & Lea du Genier entered the ring. To the delight of her supporters, Amy and her pony went clear so remained on 8 faults overall. Next in was Faye Adams & Some Like It Hot and with temperatures reaching well over 35 degrees, hot it certainly was. Possibly the mare was feeling the temperature as she too had 8 faults and so moved down the order to join the group on 12 faults. Emily Ward & King Mac had one fence down (so moved onto 8 faults) before defending Champions, Millie Allen & Song Girl entered the ring. A stylish clear left them in 2nd= at the end of the round behind Ninon Castex (FRA) who had also gone clear to remain on 1 fault while the overnight leader, Jessica Toelstang, also had a fence down to drop join the group on 4 faults. Overall, out of 30 riders, there were just 7 clear rounds and one rider was eliminated for 2 refusals. For the second round, the course was changed and the new fence 4 was an oxer situated on the edge of the area in the shade of the trees and this was a significant contrast to the strong sunlight for the other fences. Although 29 riders were down to start this round, GB's Alex Gill and one of the Irish riders withdrew. Both were carrying forward 24 faults, so were very unlikely to move up the order and so not jumping their ponies again in the heat was a sensible decision. So, first of the GB riders to go in this final round was Faye Adams & Some Like It Hot and they did a lovely clear to finish on 12 faults and 8th=. Amy Inglis & Lea du Genier went a few ponies later and to everyone's delight, they repeat their first round clear and stay on 8 faults overall. Only 2 other riders achieved a double clear in the Individual final and there were only 8 clears in total in the second round. Next for GB was Emily Ward & King Mac. This 8 year old gelding of unknown breeding has been competed by Emily since February 2011 and they did their first international competitions (at 1m15-1m20) in 2012. They too went clear and also stayed on 8 faults. With 3 riders on 4 faults and one with just 1 fault still to ride, 8 faults looked uncompetitive especially when Susan Fitzpatrick (IRL) & British-bred Rock Dee Jay (Arko III x unknown) went clear and maintained their 4 faults overall. Millie Allen & Song Girl needed a clear to have a chance of winning and with Song Girl only having had a toe in the water all week, this looked possible. Sadly, they knocked down fence 4 (in the shadows) and they joined the group with 8 faults. However, when the last 2 riders had 4 and 8 faults respectively, Susan Fitzpatrick & Rock Dee Jay were the only ones on 4 faults and so won the Gold medal outright and the 5 riders (including 3 for GB) on 8 faults had to jump off for the Silver & Bronze medals. First to jump was Lars Volmer (GER) & Carrick 13 and they had 4 faults in 34.04 seconds. Next in were Amy Inglis & Lea du Genier and they looked to be on track for a steady clear until they had the second part of the double down and although Amy then increased the speed, the were unable to beat Lars' time and stopped the clock on 34.40 seconds. Emily Ward & King Mac were next and set off with purpose and achieved a clear round in 33.52 seconds. A determined Millie Allen was next and an even faster clear (32.91 seconds) ensured that she'd get a medal. While British & Danish supporters held their breath, last to go, Jessica Toelstang (DEN) & Nikolina flew round the course and as they cleared the last, all were watching the clock. To the delight of the British supporters, she was slightly slower than Millie but her time of 33.28 seconds was enough to win her the Bronze medal. When interviewed on the podium Millie said it was amazing to get a medal again and she was please for Susan. This is Millie's final year in ponies and adding Team & Individual Silver medals to the Team & Individual medals she won in 2012 is a fantastic achievement. Millie has had Song Girl since the mare was 5 and has brought her on herself over the last five years. Susan, in contrast, has only been riding Rock Dee Jay for less than a year as he won Individual Silver in 2012 ridden by Lisa Nooren. Rock Dee Jay was also a key member of the 2011 Silver medal winning Irish team and then finished 11th individually ridden by his owner's son, Max O'Reilly Hyland. Rock Dee Jay (Arko III x unknown) was bred by Sharon Quigley and is out of Sharon's now deceased Grand Prix mare, Dee Jays Rio Grande. Both Emily Ward (who finished 4th) and Faye Adams (who finished 8th=) are young enough to be eligible for the Pony Team next year, as is the 5th British rider, Alex Gill. With both of the girls finishing in the top 10 and Alex with his British Bred pony having also gained valuable experience, there is potential for an even better results at next year's Championships. Overall, there was great praise for the venue and organisation from all the riders and Chef d'Equipes as well as from the Ground Juries and Technical Delegates. Arezzo Equestrian Centre seemed delighted to be the hosting the event and made everyone feel very welcome. The Centre is said to be applying to host the Championships again in 2015 and the feeling was that all attendees would be delighted to return - certainly Claire Williams is hoping that her daughter Erin is selected for the 2014 Junior European Dressage Championships as they are being held at Arezzo and she would love another trip to the site.